A bespoke, hand woven chandelier for special environments. The HALO chandelier is a striking focal feature which combines precise geometry with tactile, hand woven materials. The soft sculptural quality of the chandelier makes it a simple yet memorable addition to a room, and the geometric purity of the design allows it to work in a variety of locations and scales, from large modern foyers to historic buildings, offices, and domestic settings. The chandelier is lit by low energy, dimmable LEDs whose colour can be smoothly adjusted by remote control from white to deep yellow, dependent on time of day and mood desired. 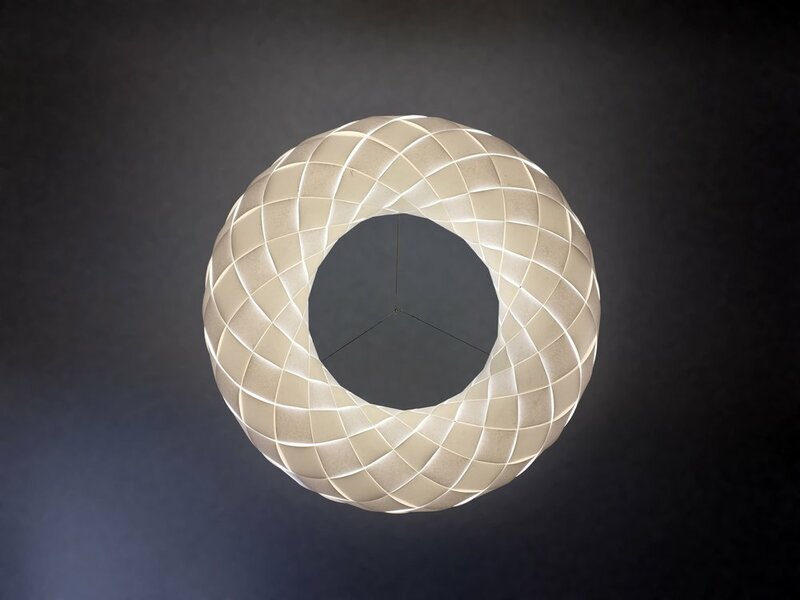 The design of the HALO is closely related to that of the 'ZONE' pendant. The HALO comes in a number of standard dimensions, and can be adapted to fit your requirements. The shade was originally developed as part of Beep Studio's refurbishment of the National Opera Studio, London. The client needed something special to create a focal point at the heart of the newly refurbished public facing areas, and rather than specify an existing chandelier, Beep Studio designed a unique bespoke pendant for them.